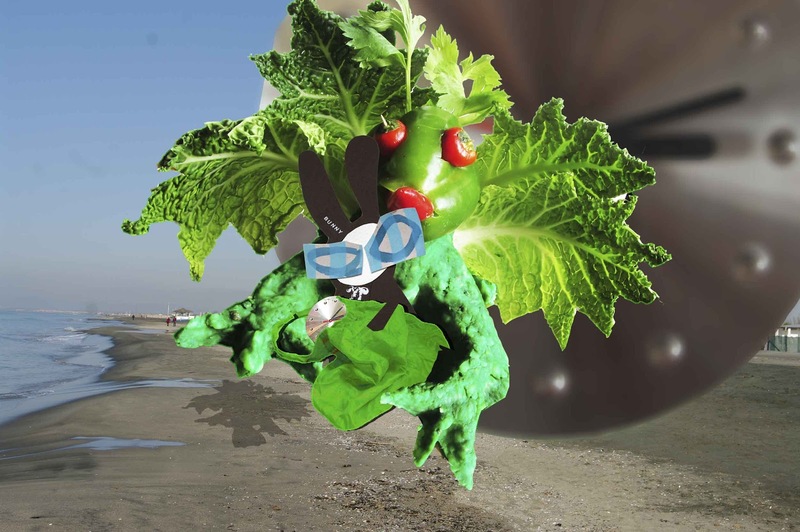 The Wabbit and Terni the food dragon soared across the countryside, carrying the talking bomb towards the sea. And all the way the bomb chattered incessantly. "Is there any way you can shut it up?" shouted Terni. "Follow the yellow brick road, follow the yellow brick road," sang the bomb. "I don’t want to fiddle with it," yelled the Wabbit. "I’ll be glad to get rid of it," moaned Terni. "Vamos a la playa, aha ha ha ha!" sang the bomb. "Aaaaaagh," shouted Terni, "it’s doing my head in." "Only a little bit further," urged the Wabbit. "Out to sea a few kilometres and we’ll hear it no more." "How do you propose to get rid of it?" queried Terni. "I’ll just dump it," said the Wabbit. "Not with my bag you won’t," grimaced Terni. "I’ll get you a new bag," said the Wabbit. "Be so good as to save my brand new bag," uttered Terni. The Wabbit began to feel the bag carefully and started to turn it. But the bomb felt the movement and it sang even more. "I’m for ever blowing bubbles," sang the bomb, "pretty bubbles in the air." "We ought to join in with this one," said the Wabbit. "How does it go?" said Terni. "Like this," said the Wabbit and he started to sing. "He’ll fly so high, nearly reach the sky." The Wabbit warbled at the top of his voice. "Then like his dreams he’ll fade and die!" "I’m up for it," said Terni and he banked steeply and headed out over the water.